Ducati Wins Daytona Sebring. 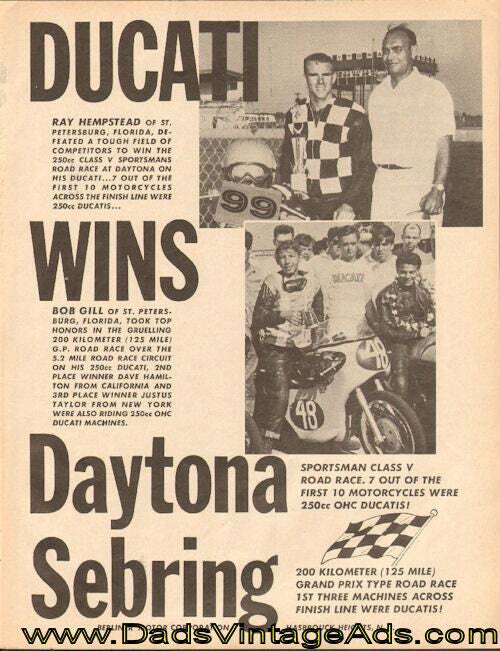 Ray Hempstead of St. Petersburg, Florida, defeated a tough field of competitors to win the 250cc class V Sportsmans road race at Daytona on his Ducati...7 out of the first 10 motorcycles across the finish line were 250cc Ducatis. Bob Gill of St. Petersburg, Florida, took top honors in the gruelling 200 kilometer (125 mile) G.P. road race over the 5.2 mile road race circuit on his 250cc Ducati, 2nd place winner Dave Hamilton from California and 3rd place winner Justus ...from New York were also riding 250cc OHC Ducati machines.